Backup seems like easy enough concept (just have copy of files, right?) but there are really numerous ways it can go wrong (or not go right when needed). I wanted for a while to look up some good guide on backup overall and recently came up on one at dpBestflow site. Site overall is collection of best practices for digital photography. Since keeping actual photos safe is important part of the process it includes extensive section on backup. 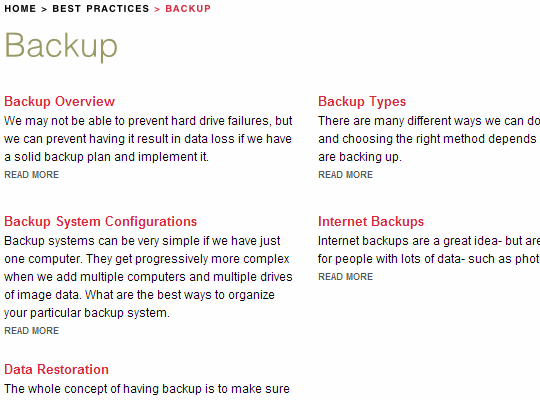 Multiple aspects of backup are covered to show how to build consistent and comprehensive backup routine. Site doesn’t touch specific tools (more than enough of those around). It focuses on basic principles of backup types, common threats to data and even advantages and downsides of specific backup storages. System configurations section is especially impressive. It has solid backup schemes for anything from single computer to multiple computers with remote server on top scenarios. Because of photography specifics (numerous and relatively large files) guide is a little dismissive about Internet storage. Those are valid points, but for smaller amounts of data (such as documents) online services like Dropbox offer free/affordable offsite backup option. Excellent guide. Highly recommended to read and check with when creating and managing backup routines. I have no trouble with any other sites. Only yours. I guess that was really really stupid of me to think that Read More was a link. I won’t make that mistake again. Sorry, no offense. It just took me back to turning every stone upside down in search of why site might be working weird for you. :) And I misunderstood at first that it is dpbestflow site that isn’t working for you. By the way how it works for you overall lately?